Among the returning crew was the special effects company, Amalgamated Dynamics — again headed by Alec Gillis and Tom Woodruff Jr., who had become committed to the series. 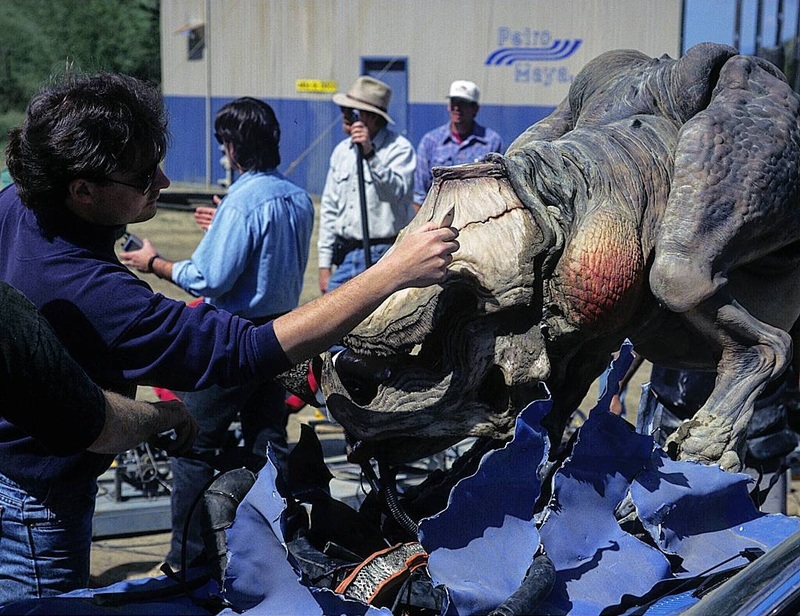 Woodruff said: “Tremors was our first project and a real labour of love with a great group of people. 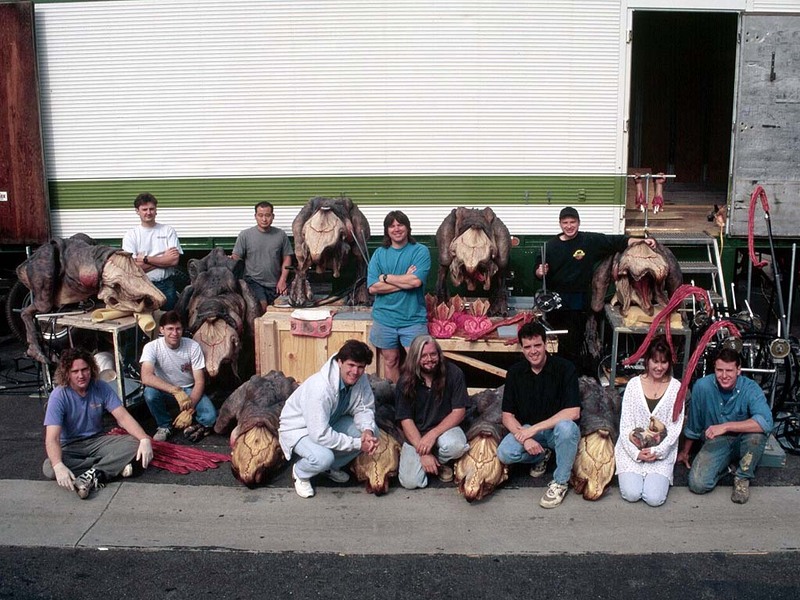 We had said that if ever there was a sequel — no matter what we were doing — we would make ourselves available.” Principal photography for Tremors 2 coincided with location shooting for Jumanji, another project ADI was working on at the time. Keeping the promise, the duo signed to work on Tremors 2, assigning Andy Schoneberg to direct the special effects work on the film whilst they supervised it from Vancouver. 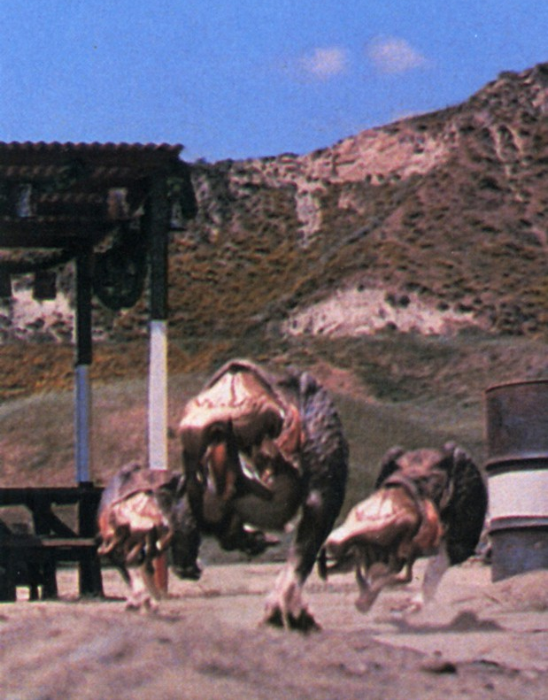 ADI only had a modest budget and six weeks to build all of the incarnations of the Graboids and their offspring. 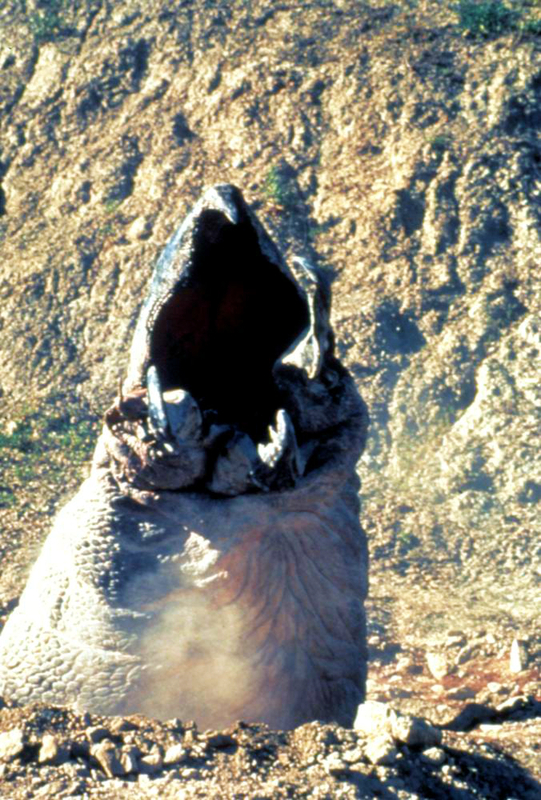 Tremors 2: Aftershocks marks the return of the Graboids — a new subspecies adapted to a different environment. “[It is] the Mexican variety of the creature, and it lives in southern Mexico on verdant plains,” said Wilson. The subterranean Monsters, whose origin was deliberately left ambiguous in the first film, are revealed in the sequel to be ancient creatures from the Precambrian period. 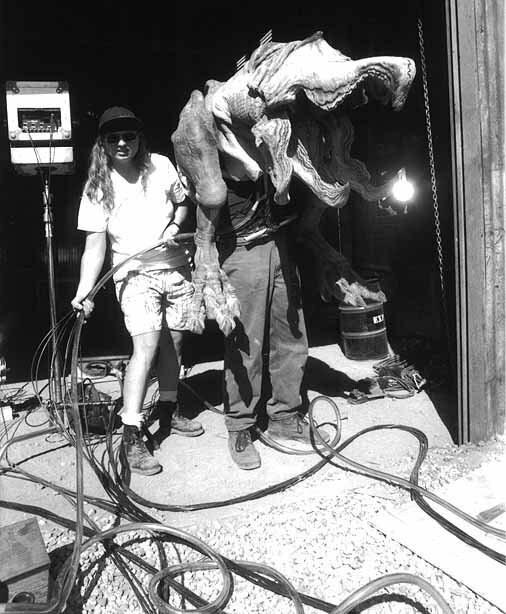 Filming the ill Graboid scene. ADI refurbished the full-size animatronic head sections used for the previous films. 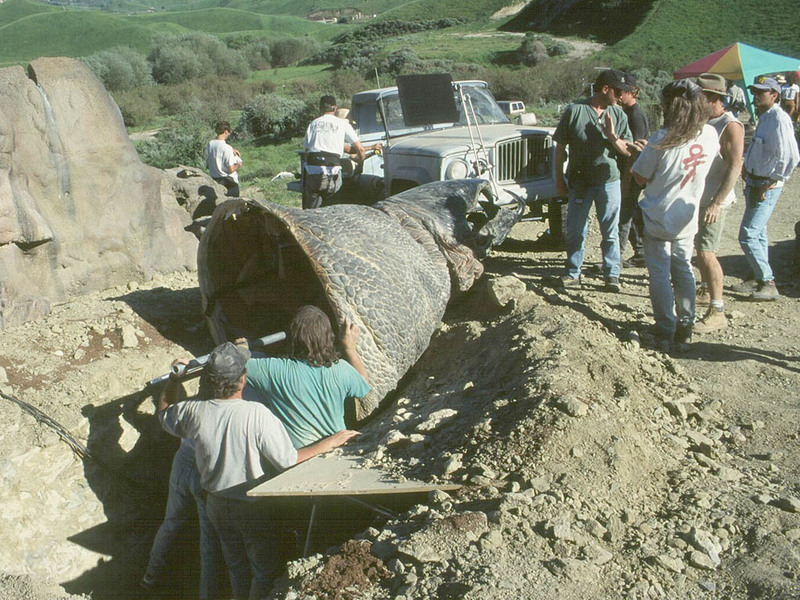 The Graboids burst through the ground with new rigs devised by physical effects supervisor Peter Chesney. Wilson recalled: “the underground rigs we used in Tremors were powered by air rams, which often jammed and never really moved the worms fast enough. I told Peter early on that one of the things we desperately needed was to see a worm come out of the ground and lift someone in the air.” Ivo Cristante’s physical effects team built a 18 feet tall, 20 feet wide platform in which to place the burst rig — an uneven parallelogram crane on which the creature was installed. 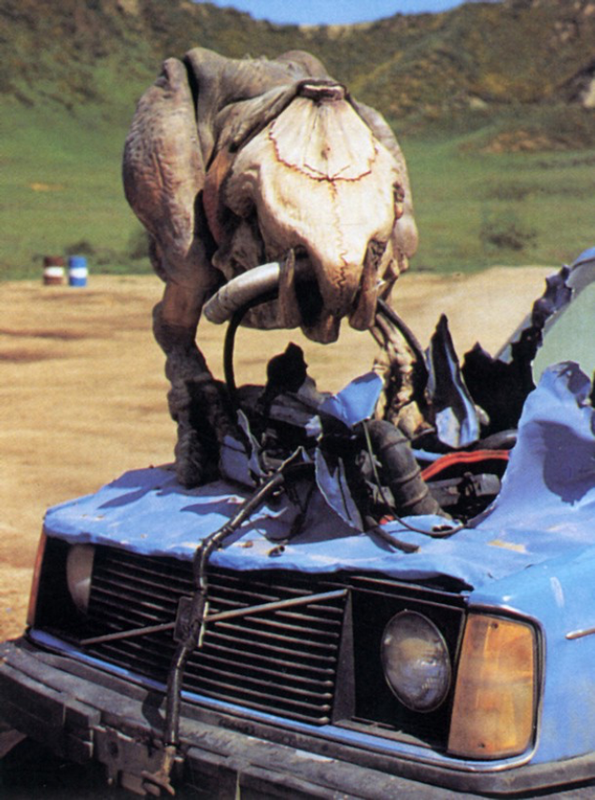 A spring-loaded device was employed for the Graboid’s fast movements. Chesney explained: “we built a nine-foot-wide steel track with skateboard-like guide wheels and added a lot of counterweight on cables to power it, including a huge amount of bungee cord. We actually had to use a block and tackle to pull it down, like loading a catapult.” The creature’s head was close to a breakaway ground surface, which was easily destroyed. Chesney continues: “we were trying to duplicate the energies of an eight-ton creature with the ability to plow through brick walls, but the puppet had to be light enough to perform properly — which meant it wouldn’t have the strength for a big breakaway. So we prepared the platform surface by layering hinged pieces of plywood in jagged sections, laid out like the scales of a fish. At the intersections, we used small sticks — and even finer sticks in the crosshatch. On top of that, we laid peat moss and sod.” For the prologue scene — the most expensive of the entire film — the spring mechanisms had to be precisely calibrated in order not to injure the stuntman contained within the Graboid’s jaws. Movements underground were replicated with a method already used in Tremors, with a wood-lined trench covered in layers of rubber and dirt — under which a cart was moved. 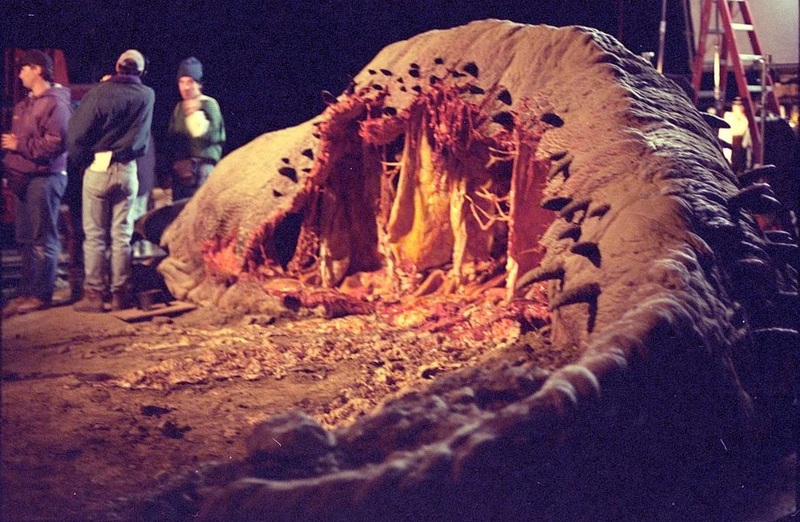 A key scene of the film involves one of the Graboids above ground, in a severely weakened state. 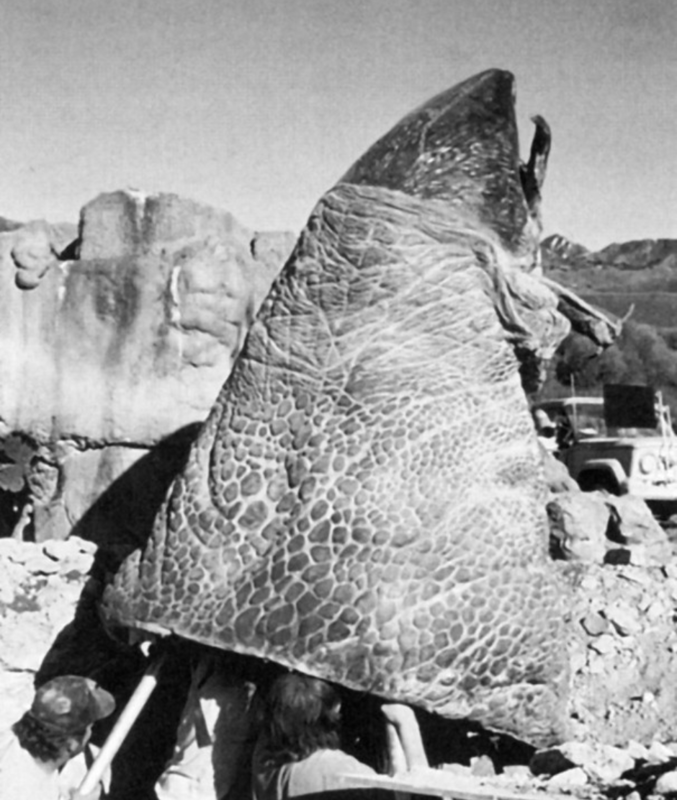 The first scenes involving the creature were achieved with the full-scale animatronic head section. At night, the Graboid is seen convulsing in its final moments. For this sequence, a 1:4th scale puppet was built based on the moulds of similarly-scaled puppets from the first film. Where the armoured head was cast in fiberglass, the body was not moulded in latex — like the previous miniature creatures — but in a new hot-melt material ADI had first experimented with on the set of Santa Clause. “It was so jiggly and lifelike,” Woodruff said. “We were able to get some really good blubbery movements to show something we really hadn’t seen in the worms yet — the conveyance of great mass and weight.” The puppet was maneuvered from a puppeteer below the miniature landscape set specifically built for the sequence, which was filmed at 96 frames per second in order to further increase the sense of mass. The creature is later found dead, with its side burst open and three sacs hanging inside of it. 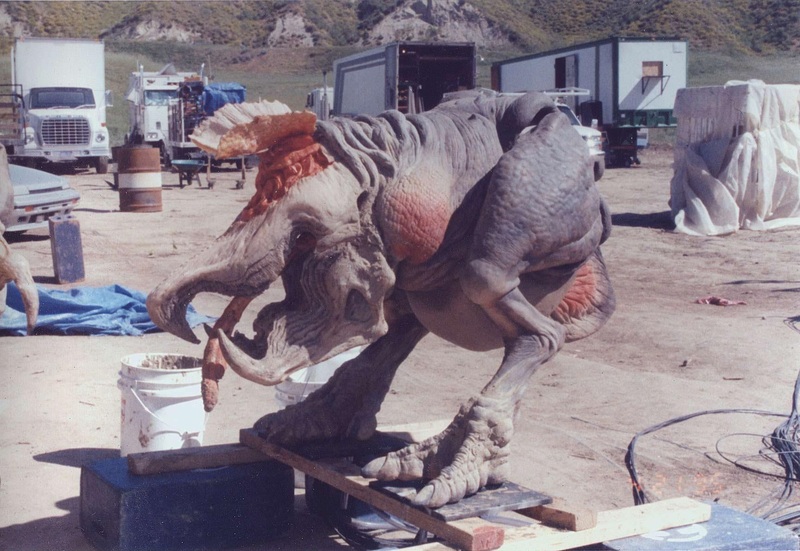 The Graboid carcass was the first model to be built for the film. It was constructed as a wood and wire armature, with polyfoam skin (as well as fiberglass beaks) cast by Marc Tyler — who also painted the creature — based on moulds from the original film. The internal organs and sacs were cast either in latex or in silicone, and once again orange methocel was used to simulate the blood. …sure ain’t no damn Ostrich. Early Shrieker concept art by Alec Gillis. Designing the Shriekers proved to be a longer process compared to that of the Graboids years before. “The Shrieker designs went through a number of variations before we finally hit on the right look,” Wilson said. “Partly it was a size thing, and partly it was the fact that these creatures are supposed to be babies — something Tom and Alec and Andy Schoneberg worried about right from the start. There’s an inherent cuteness to babies — but we knew the Shriekers had to be scary; otherwise audiences might start feeling more sympathetic toward the Monsters than the humans.” A key element of the new baby creatures was their heat-based vision that detects the bodily heat of organisms and objects. Gillis and Woodruff started sketching and sending concepts to the production from Vancouver. Gillis said: “we knew that they wanted two-legged little creatures that ran around, saw by infrared and emitted a scream upon sensing a source of food. One of the features of the original movie’s creatures was the big four-piece head, jaw and mandible assembly; and we wanted to maintain that.” The final design featured a body with infant-like proportions, the signature armoured head, as well as three-toed legs inspired by ostriches and a short, fleshy tail. 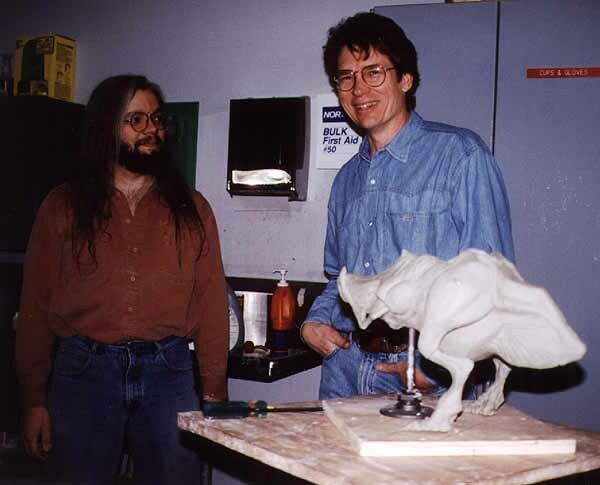 The Shrieker maquette, with Andy Schoneberg (left) and S.S. Wilson (right). 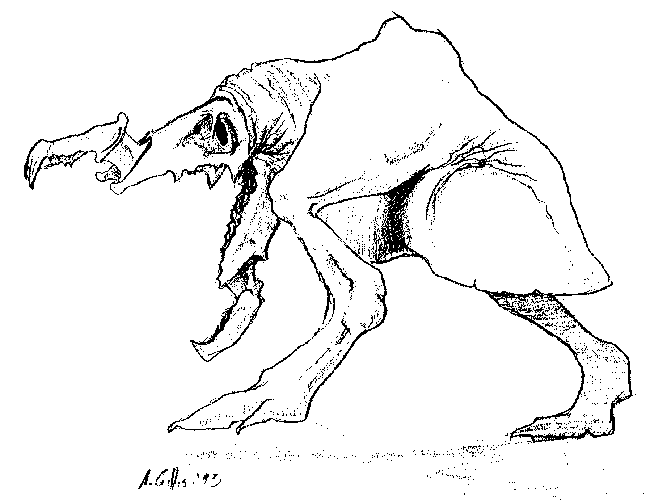 Being infant Graboids, the Shriekers were designed with several details that were reverse-engineered from the previous creatures. Woodruff recalled in our collaboration interview with Strange Shapes: “[the Shrieker design was] very much inspired by the Graboid itself. The idea was to reverse-engineer the original creatures to establish the Shriekers as an earlier developmental stage, hence the translucent beak, for example, as if it was still cartilage in development like a baby’s skull. The growth pattern would eventually have them begin to pack on pounds and become so huge and lethargic that their legs (which were only intended to carry them to a new location where food and protection would be more plentiful) would atrophy and fall off. They would then create a growth of spines that would propel them underground.” The skull in development was a key trait. Woodruff said in the Monster Makers website: “we designed [it] to look as if it was still in cartilaginous state before the beak shells hardened, like on the adult worms.” Another subtle detail in the design is the Shriekers’ tongue — which ends in three elongated bulb-like appendages joined together, suggesting the Graboids’ signature tentacles still in development. A key element of the design was the heat sensor on the Shriekers’ head. This organ, when exposed, allows a better focus on the heat signatures of the surrounding environment. Several variations were tested, as recalled by Gillis: “we tried panels that lifted up from the head like gull-wing doors to reveal the sensory organ inside, but Steve was concerned that those might look like ears. He wanted something totally non-anthropomorphic. Then we toyed with the idea of a plate on top of the head that lifts up; but we were afraid that would look too much like a trap door — something you’d expect to see Thing from The Addams Family pop out of. Finally, Andy came up with a three-plate design that was more organic looking.” A central plate first rears, followed by two side plates — which in turn fully reveal the pulsating heat sensor within. With the final Shrieker design approved by Wilson, ADI began building the full-scale creature puppets. The life-size sculptures — based on a maquette sculpted by Alec Gillis — were sculpted by Jim Kagel (who sculpted the body) and Brent Armstrong (who sculpted the head). The skins were cast in foam latex by Mark Viniello, whereas the head pieces were moulded in semi-translucent fiberglass by Steve Frakes. All the creatures were painted by Tom Kileen and Doug Stewart. ADI built two hero animatronics with fully articulated bodies, three hand puppets with articulated heads, and five stunt creatures whose purpose was to be hit, damaged or shot; they were in fact filled with orange methocel and pieces of latex. Their remains are thrown at the end of the film when Shrieker carcasses are scattered by the enormous explosion. 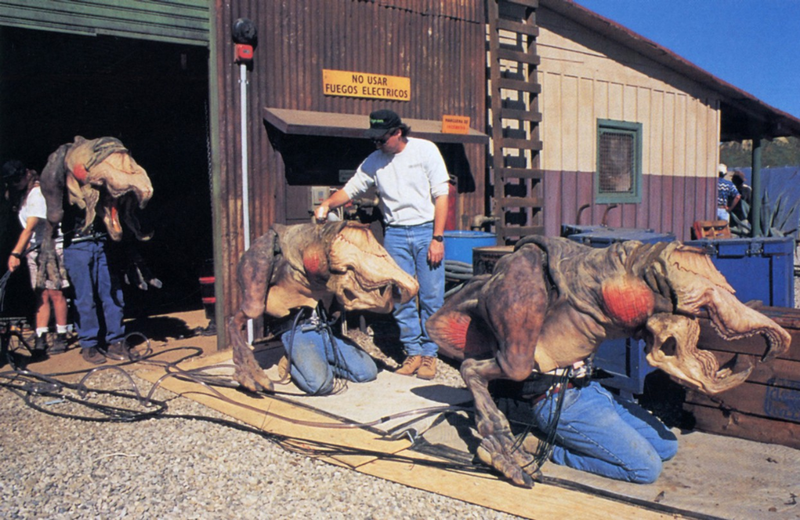 Also built were three insert animatronic tongues for close-up shots. One of the hero Shrieker puppets. The mechanical systems of the creatures were designed and constructed by David Penikas; the hero animatronics featured the most complex, cable-driven mechanisms. Jaws and mandibles were fully articulated, and bladders inside the head suggested the pulsations of the heat sensor when the organ was exposed. Bladders inside the jowls also simulated the Shriekers’ breathing. The cables passed through the Shriekers’ feet and were buried in the ground area next to them, only to re-emerge next to the controlling mechanisms. 8 to 16 puppeteers were needed to fully maneuver one of the hero puppets. Producer Nancy Roberts and Tremors director Ron Underwood also occasionally collaborated to the performance. One of the Shrieker hand puppets. 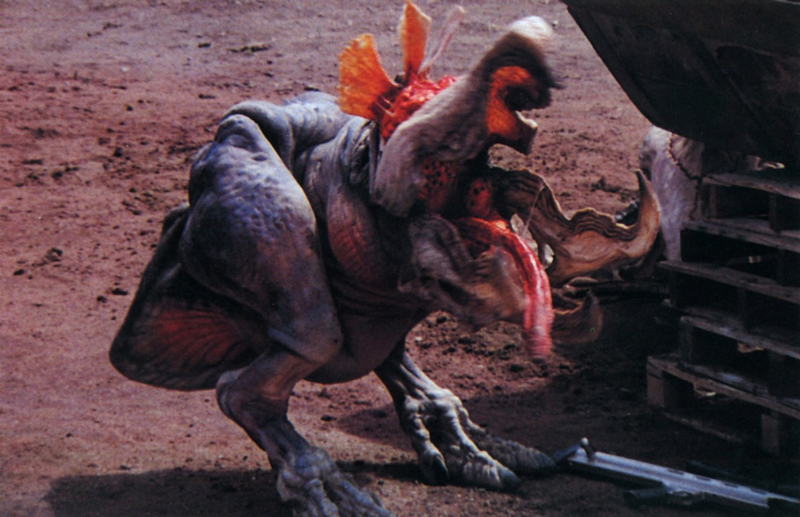 Despite being an infant stage of the Graboids, the Shriekers are also able to reproduce asexually: after having eaten enough nutrition, they regurgitate a newborn creature. For the sequence where this new feature is revealed, an almost amorphous fetus was sculpted by Marc Tyler and painted by Tom Killeen — and dubbed the ‘vomit baby’. The fetus was covered in a slimy membrane and pushed out of one of the Shrieker hand puppets — adapted with hyperextending jaws. 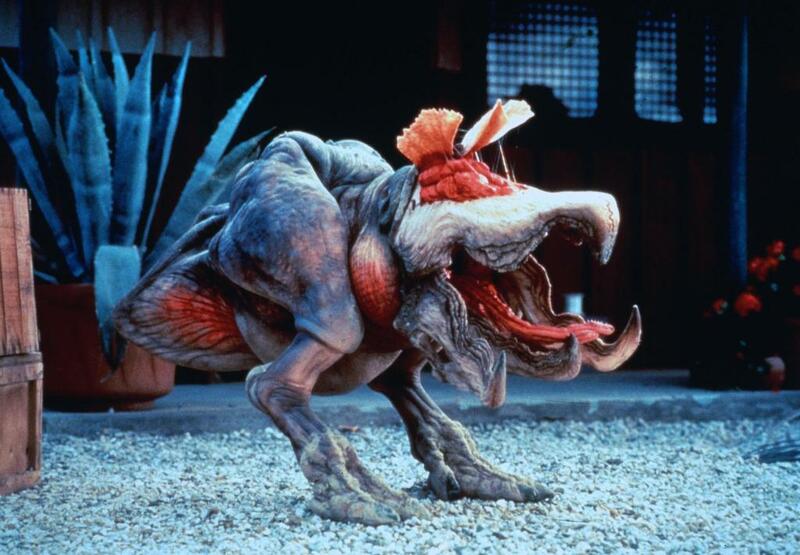 The subsequent shot of the newborn breaking its placental sac and screaming was achieved with one of the hand puppets, puppeteered by Yancy Calzada and shot in an oversized cage section built by production designer (and original Tremors crewmember) Ivo Cristante. Tippett actually provided input in ADI’s designs, suggesting wrinkle areas. “Once we had some idea of what Tom and Alec were going to do, we could make a few suggestions,” Tippett said, “such as how to fit certain body parts together or where to put the wrinkles in the skin — things that would make our work easier.” Tippett Studio art director Craig Hayes supervised the creation of the digital Shriekers. He recalled: “we began by scanning photographs of ADI’s Shrieker maquette into our computer and tracing over it. As soon as ADI completed one of the full-scale puppets, they sent it to us for reference and we took our measurements from that.” The digital model was built by Peter Konig and painted and texture-mapped by Paula Lucchesi to be as accurate as possible to the practical creatures (something also aided by reference photos taken on location). Dusty textures were also added. Animation was achieved with an array of different techniques, as recalled by Hayes: “anywhere from one-third to two-thirds of the animation was done through stop-motion input, using a Shrieker armature, built by Bart Trickel, and our own motion input software. It was very similar to the methods we used on Jurassic Park.” Said armature was a DID (Digital Input Device), a small-scale model with motion sensors that transfer its movements to the digital model. A limited number of shots was also created with standard key-frame animation. 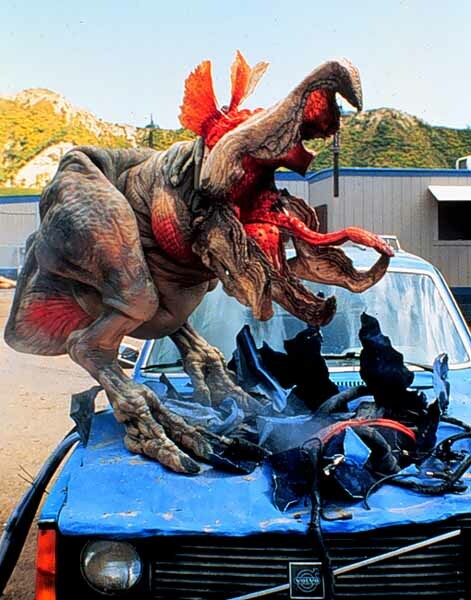 For more images of the Graboids and Shriekers, visit the Monster Gallery. 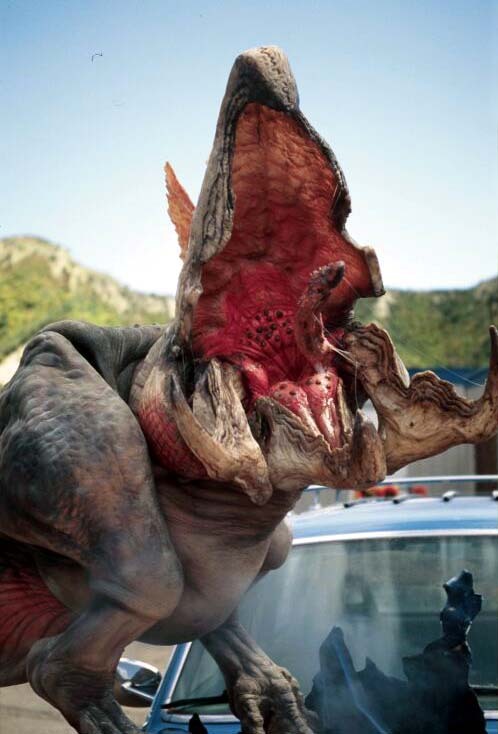 Posted on 24/09/2014, in Movie Monsters and tagged Amalgamated Dynamics, Graboid, Phil Tippett, S.S. Wilson, Tremors. Bookmark the permalink. 3 Comments.